We've asked, you've answered, and now we're following through! Thanks to everyone who has filled out the HOME Survey so far, we're implementing new ways to communicate with you about everything happening at HOME HQ each week. Check back here for weekly updates and new opportunities to have your music and/or business featured. We want to know more about all of you, your music, your work, your company, current projects etc. If you'd like to be a featured HOMIE, please click the link below to let us know. We're setting up a Spotify playlist that will feature new music from our HOME Members. If you have music on Spotify, let us know and we'll add it to our playlist. It's all hands on deck as we work to make HOME Stage more sonically suited for concerts and live events. We'll be making some acoustic panels for the live room from 3:00-7:00 pm on Wednesday, May 9th. Please join us! Roll up your sleeves, come help us out, and learn a few new skills at the same time. Thanks in advance for your help Homies! Follow the directions below to book sessions with any of the mentors featured this week. You must be a HOME member to schedule. Joanna Barbera is a yoga and meditation instructor, mindfulness coach, musician and singer-songwriter. She specializes in offering practical methods that can offer relief to those who struggle with anxiety, stress, depression and a general feeling of disconnect. Whether you are an artist or in the industry, each session is designed to meet the individual's specific goals and needs. Sign up now to reserve your 1-on-1 meeting with Joanna at joannabarberamusic@gmail.com or just drop in while she's here and see if she is free. Click below to reserve your mentoring session with Femke. Sign up now to reserve your 1-on-1 meeting with Brian Bauer, President of Bauer Entertainment Marketing. Use the link below to book a session. Nashville: Join us for a happy hour and a live DIY Musician Podcast recording! 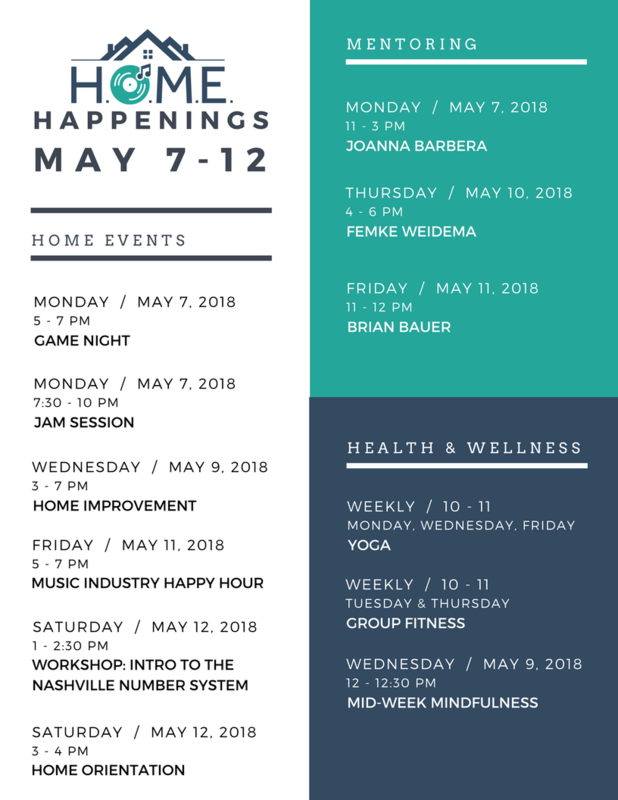 You're officially invited to come have a drink on CD Baby, join a live DIY Musician Podcast recording, and mingle with your fellow musicians in the Nashville artist community to network and share ideas. The podcast recording with Kevin Breuner, VP of Marketing, and Chris Robley, Blog Editor, will begin at 5pm, where they'll be discussing Everything You Need to Forget About the Music Business. The music industry has changed more than you think. In this live-taping of CD Baby's DIY Musician Podcast, you'll hear about ten aspects of a successful music career that the music biz STILL gets completely wrong. Where are PR efforts going to waste? What are untapped strategies waiting right under your nose? Come be a part of this podcast recording! CD Baby will be providing happy hour drinks and swag, too. Please RSVP if you plan to attend, and we hope to see you on May 16! We've partnered with Music Biz on a special discount for members of H.O.M.E.! Nashville-based Creatives (artists, songwriters, producers, etc.) and indie individuals/startups/small companies who have never experienced the Music Biz conference before can register for a special badge for just $279 with code HOME2018. * Those looking to make a return to Music Biz, can register for a $499 returning ticket. Click here to register today to join the 2,000+ attendees expected to descend on Nashville for the four most important days on the industry calendar. Visit musicbiz2018.com for more info. H.O.M.E. is excited to celebrate with our friends at the Music Business Association as they celebrate sixty at MUSIC BIZ 2018 — the four-day innovative conference is set to take place from Monday, May 14 - Thursday, May 17 at the Omni Nashville. The must-attend annual music business event will bring together global power players and industry enthusiasts committed to the future of music monetization for 100+ panels, presentations, workshops, private meetings, cocktail parties, live music, and more. Highlights include keynotes from mega-manager Scooter Braun, Pandora's CEO Roger Lynch, and Republic's Wendy Goldstein; Digital Service Workshops with Amazon, Apple, Pandora, SoundCloud, Spotify, and YouTube; sessions on podcasting, playlisting, streaming income, interactive downloads, unclaimed royalties, digital marketing, merch, metadata, and so much more. Click here to view the full schedule. *To register, click tickets, then add in the promo code at the top of the page, and these special tickets should appear. Attendees who have attended before are not eligible for the discounted first-time ticket option. If you have any questions, please reach out to Nick Maiale at nick.maiale@musicbiz.org.